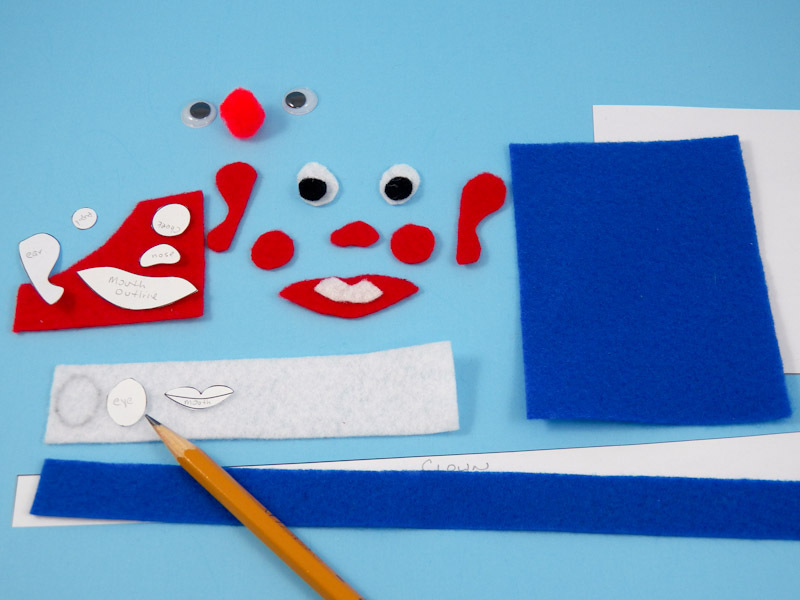 In this project, you will create quick and easy hand puppets based on Styrofoam® balls used as puppet heads. You can use felt cutouts and/or pom-poms and wiggly eyes to add a funny face to your clown puppet. 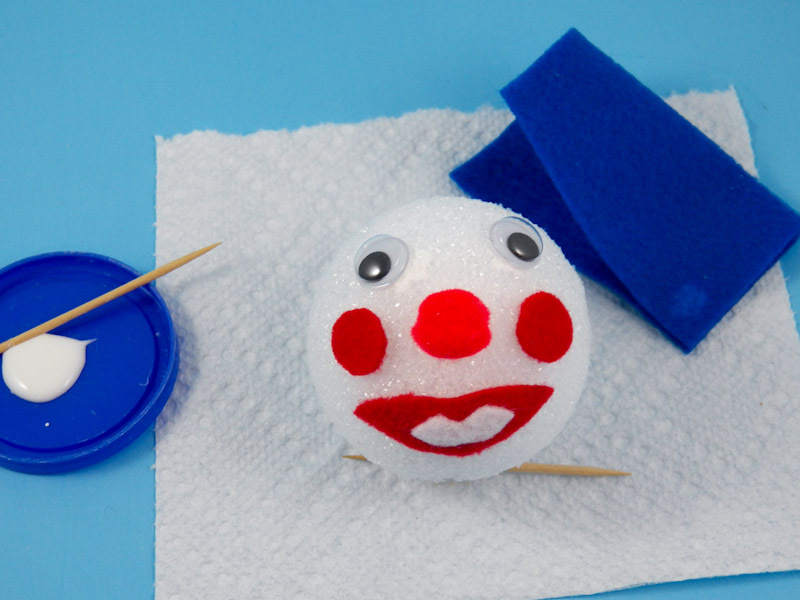 Make a hole in the foam ball for your finger, and add a square of cloth to complete your puppet. 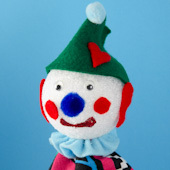 Once you have made a clown puppet, you'll see how easy it is to make a variety of characters, like the pictured king puppet, by changing the cutouts glued to the foam ball. 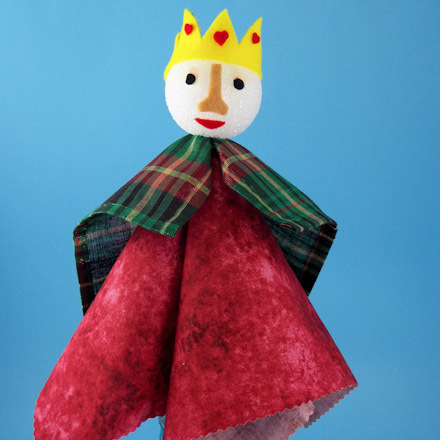 For more puppet craft projects—many including plays to act out with your finished puppets—see the Puppets Around the World craft project index. You will decorate the foam ball with a clown face by adding felt cutouts and/or pom-poms and craft eyes. 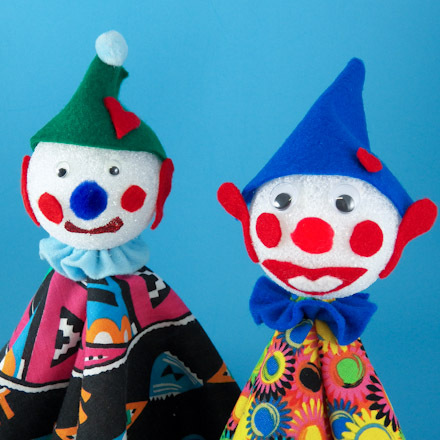 You can use Aunt Annie's printable pattern for the clown puppet cutouts, but you may find it just as easy, or even easier, to cut out shapes freehand. 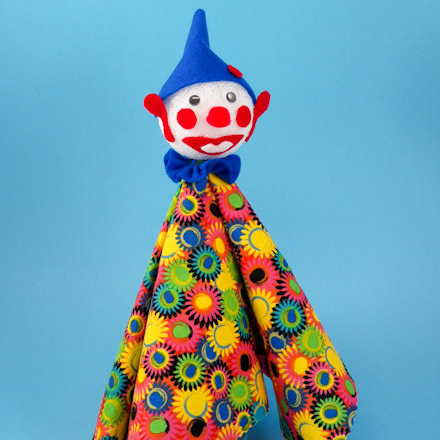 In any case, use the clown cutouts pattern as a reference for all of the clown cutouts needed, and their approximate sizes. 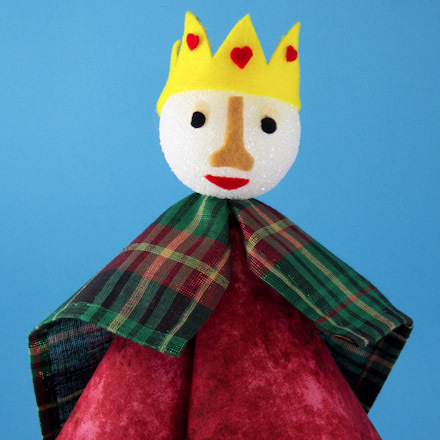 For a little variety, and to see how easy it is to create other puppet characters, use the king puppet cutouts to make a regal king or a clown king. Decide what colors of felt you will use for each clown face decoration. To keep it simple, cut the eyes and mouth from white felt, the eye pupils from black felt, and everything else from red felt. You could make the hat and clown ruffle from another color, like blue. If you are using the cutout patterns as templates, cut out each pattern piece on its black outline. Pin each pattern onto a piece of felt or trace around it with a pencil. Cut around the patterns or on the traced lines. Cut one or two pieces of felt as indicated by the pattern piece. Tip: Instead of using felt cutouts, you might use a ½" pom-pom for the nose and wiggly eyes in place of the felt eyes. You could even use glitter glue for the mouth or acrylic paint to create the clown's face. 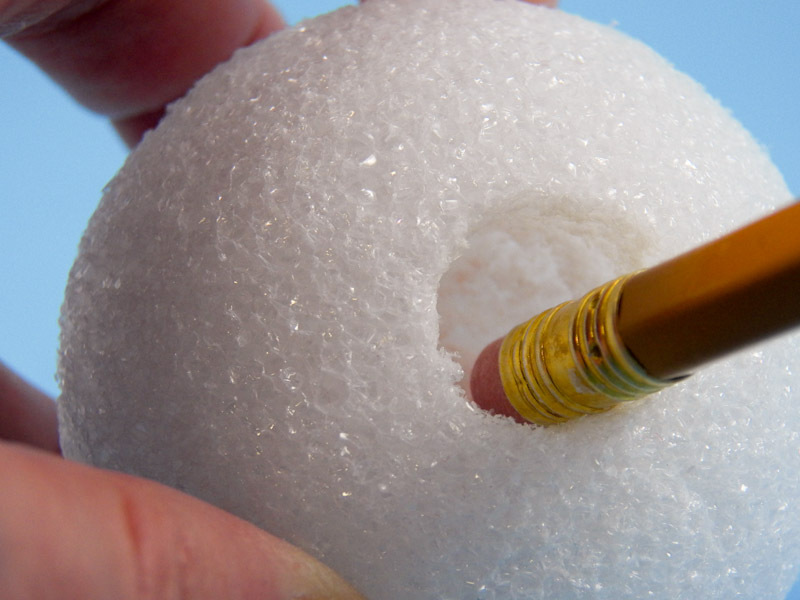 Use an unsharpened pencil or the eraser end of a pencil to dig a hole in the foam ball for your finger. Make the hole large enough to fit your index finger up to the first joint, and wide enough to fit a little loosely on your finger. Glue the facial decorations on the foam ball with a good-quality white craft glue. to make the clown's hat, fold the hat felt lengthwise and glue two corners together. Glue the other two corners to opposite sides of the clown's head. Place the decorated foam ball on a pencil in a cup to dry. Create a ruffle for the clown's neck by stitching one edge of a felt strip and gathering it into a ring. Cut a 36" length of thread and double it. Thread the needle and tie a large knot about 3" from the end of the doubled thread. 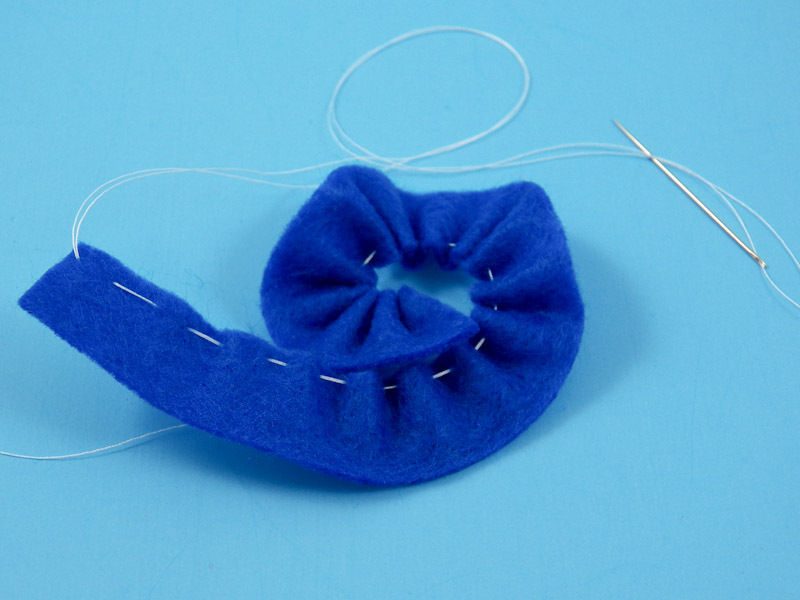 Sew a long running stitch near one edge of the felt strip. Make even stitches that are at least ¼" long. 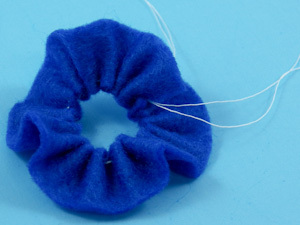 Pull the tail of the thread nearest the needle to create gathers in the felt. Continue to pull the thread until you can form a ring with an opening a bit larger than your finger. Tie the two tails together with a square knot or two. Snip the thread tails off about ½" from the knot. 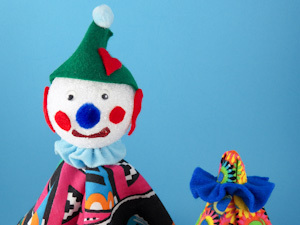 To complete your puppet, you will need a piece of cloth for the clown's clothing, which you will drape over your hand. Cut a 12" to 14" square of lightweight cloth to use as the drape for your hand. You may want to pink or hem the edges to avoid fraying. You might use a handkerchief or bandana in place of the cloth square. Place the center of the cloth over your index finger and slip the ruffle over it. Stick your cloth-covered finger into the foam head. To operate the puppet, use your index finger to move the head. Use your thumb as one arm, and your middle finger as the other arm. Fold your other fingers into your palm. Now it's time to put on a play! Think of what your puppet will do. Where does your play take place? Do you need to make more puppets for your play? If so, what do they look like? Will more than two puppets be on stage at once? Do you need a friend to help? Rehearse your play a few times, and then perform it for family and friends. Tip: Cut a 12" to 14" square from colorful cloth to use as the clown's clothing and to hide your hand. Fabrics with dots are especially nice. 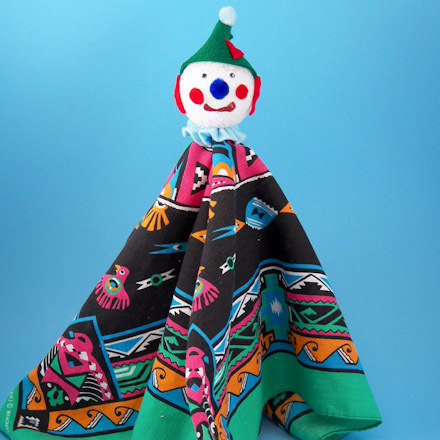 Tip: You can also use a handkerchief or a colorful bandana as the clown's clothing. It's fine if the bandana is larger than 14". Tip: The clown's features can also be painted on the foam ball. This clown has a mouth painted with red glitter glue. 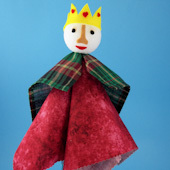 Tip: It's easy to make other puppet characters, like this king hand puppet, by changing the cutouts and the cloth drape.